PHUKET HALLOWEEN PARTY MANHATTAN – UPTOWN NYC - HOTTEST HALLOWEEN PARTY NYC HOTTEST! 2 DECORATED HALLOWEEN FLOORS OF TERROR – YOUNG JEEZY LIVE! HALLOWEEN PARTY! 1 DAY - 1 EXCLUSIVE EVENT! YOUNG JEEZY LIVE AT PHUKET WITH MUSIC BY NYC HOTTEST DJS HOT97 FUNK FLEX & TRIPLE THREAT & MORE AT PHUKET NYC HALLOWEEN UPTOWN NYC PARTY ! TICKET EVENT 21 & OVER ! HALLOWEEN PARTY @PHUKET NYC IN UPTOWN NEW YORK CITY MANHATTAN, NY! CAPACITY EXPECTED! BUY YOUR TICKETS NOW FOR 50$! ID a must. 21 & over - Doors open at 10pm SHARP till 4am. Phuket NYC Halloween Dress Code: Its Halloween – be creative! Costume Party! Phuket NYC Halloween Bottle Packages: Bottle Prices available by request. Tickets are going to be worth more later so we highly suggest you to buy them now. AFTER PURCHASE NOTE: PLEASE CALL TEXT US AT (646) 220-8460 OR (347) 592-0300 TO CONFIRM YOUR PURCHASE! 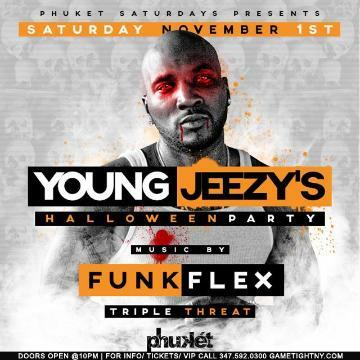 YOUNG JEEZY PHUKET NYC HALLOWEEN!